The establishment, which also operates a Silver Lake location just barely a mile east (on Hoover and Bellevue), specializes in self-roasted blends of organic-quality (basically Certified Organic, but without the piece of paper and the fees) fair trade coffeebeans from Ethiopia, Peru, El Salvador and Panama. Best of all, unlike the previous establishment which closed in August, the place is open past 8 p.m. They’re open until 10 p.m. most weeknights. And whereas City College Cafe was closed Sundays, Cafecito Organico is open on Sundays, from 11 a.m. to 6:30 p.m. And the biggest coup…no crankly owner! 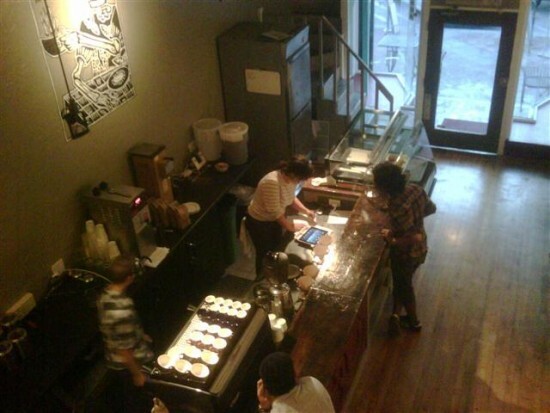 Sorry, don’t mean to rant, but City College Cafe’s owner Sergio was a total crank. Although he made a real excellent espresso, he closed down the place at 8 p.m. and gave lots of, “So you’re gonna buy something or what? !” comments to those who just hung out. Sheesh, even Starbucks doesn’t do that. I don’t even think he got any of my explanations about the neighborhood council or the community. So when he closed up shop in August, it was good riddance. I knew a better coffeehouse operation would replace it anyway. Cafecito Organico joins Scoops next door, the Bicycle Kitchen a couple doors away and Pure Luck Restaurant and Orange 20 Bikes across the street. 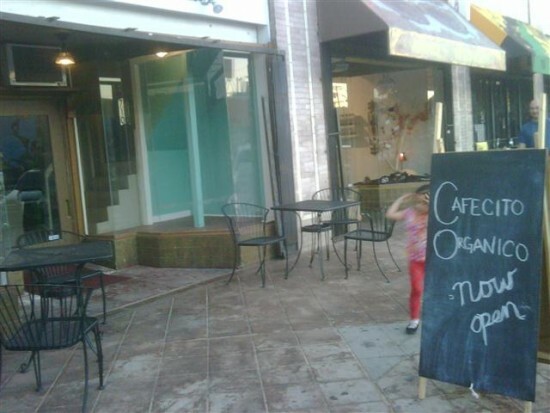 So best of luck to Cafecito Organico and its owners, Angel Orozco and Mitch Hale, who, according to some folks I’ve talked to, apparently aren’t cranky folks. If you’re in Hel-Mel for CicLAvia, stop by and check ’em out!